Winter pressure washing in Nashville, TN - Pro Wash LLC. Cold weather presents specific challenges for the Nashville pressure washing industry. This article will not only define some of these challenges, but offer solutions and helpful tips to keep your property looking great even in the coldest of temperatures with winter pressure washing. THE DANGERS OF ICE: We all know that water freezes at 32°. This is perhaps the biggest challenge to a pressure washing contractor because he is at the mercy of the weather forecast. Cleaning with high or low pressure water in sub-freezing temperatures can create a hazardous environment for customers, tenants, and employees alike. The actual hours that a pressure washing company can work are reduced because even on warmer days, the higher temps usually don’t come until mid to late morning. 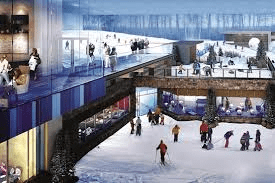 The contractor must also allow ample time for water to dry before temperatures drop so that ice does not form on the surface that was cleaned. COLD AFFECTS CLEANING AGENTS: Several compounds in cleaning detergents weaken and lose strength in cold weather. It may not be an option to use the proper chemical for the job unless it’s one of the random warm days that we have during Middle Tennessee winters. Although, there are other remedies for this problem. Using heated water can help raise the temperature of the cleaning solution themselves as well as the surface that is being cleaned. For example, we sometimes mix our house washing solution, pre-wet, apply the solution and rinse, all with 80°-90° water. This boosts the effectiveness of the cleaners so that the results are equal to cleaning the same surface on a warm spring day. OPERATOR COMFORT: There is nothing glamorous about pressure washing in 35° weather. You won’t see anyone “dressed to impress” when working with water when it is near freezing outside. The proper attire is essential in achieving maximum efficiency. Several warm layers of clothing underneath a waterproof outer layer is the preferred wardrobe, along with knee high waterproof boots. This will keep the operator dry and warm so that the few hours per day that it is warm enough to wash can be spent wisely and most efficiently. 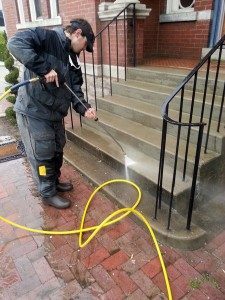 Now that we have identified some common challenges pertaining to pressure washing in cold weather, let’s take a look at some things that can be done as preventative maintenance to keep your property looking great year round. Keep the proper receptacles at entrance ways. People will be less likely to dispose of stain causing waste (chewing gum, cigarette butts, etc.) when the proper waste receptacles are present. Regular cleanings. Having a property cleaned regularly will keep dirt and debris from setting in. If one of the routine cleanings must be postponed due to the cold weather, it will be less noticeable if the property has been maintained up until that point. Keeping trees and landscaping trimmed away from the roof and walls of structures. Tree limbs emit sap and leaves as well as provide habitat for birds and insects. Keeping trees trimmed away from the structure will reduce the amount of debris able to come in contact with the surfaces, thus reducing the chances of staining. Be proactive, it is very common for homes and businesses to schedule power washing services during Autumn months, so that cleaning will not be necessary during the winter months. In conclusion, Nashville area power washing projects can still be completed in the winter months, it just takes a little more knowledge, effort and dedication. Weather patterns in Middle Tennessee are mild compared to the rest of the country, so the bitterly cold periods are typically short lived. If one of our customers is in need of our services during the frigid portions of the year, we will do our absolute best to accommodate them. For any questions or concerns about your next exterior cleaning project, view our website or give us a call, we would love to help!